Pampers understand baby’s skin is the softest, so premium care pants have been made using soft materials to provide softness and comfort. Also, the all-around waistbands and leg cuffs ensure a snug fit, minimizing leakage and making movement more comfortable for baby. While I have studied from all Mums around me that generally 5-6 hours of diaper is preferred but with this we checked that for apporx 8 hours the baby is very much comfortable. This is stress free for all mums. Pampers premium care pants come with ultra-dry core that quickly absorbs and locks away liquids. As mentioned earlier in this post, the lotion has its advantage to protect the skin of the baby. Generally all elders suggest that we should leave baby free from diapers for few hours in a day that shall enable the skin to breathe. 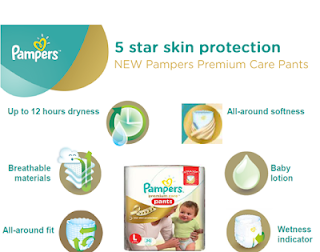 But Pampers has solved this problem, the micro pores in Pampers premium care pants help air circulation, allowing my baby’s skin to breathe. The only way a baby communicates his discomfort is by a cry. You remember how I discovered the time to change the diaper by the smell of the poo. But the unique wetness indicator that turns from yellow to blue when in contact with fluid really works. It’s good that pampers premium care pants come in all sizes so all the Mums can be happy now and baby can have good sleep.